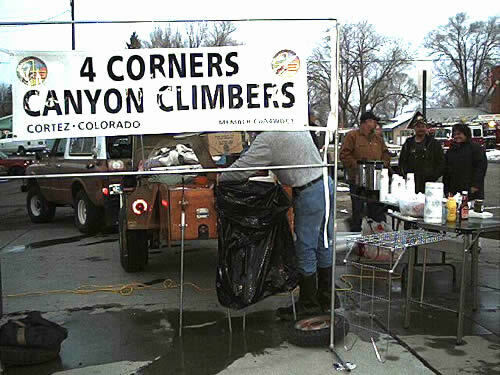 In 2001 the Canyon Climbers decided to help the community by adopting two local families in need. In October and again in December we held hot-dog and drink sales to raise funds for our adopted familes. All in all we raised over $300 to help buy clothes for the children, help pay utilities, and generally keep the families going through the winter months. We want to extend our heartfelt thanks to every one who donated food, time, or money to the cause. We made a small difference in the lives of good people with the help of every one in the community. Thank you all! 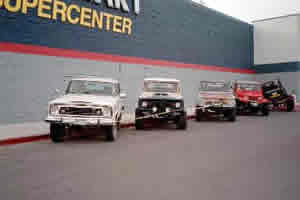 The 4CCC has been participating in the Spruce Up Colorado program since 1998. 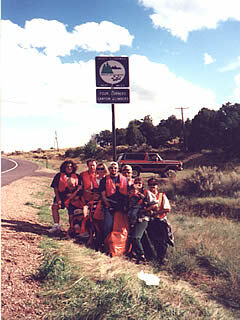 Several times each year we gather at our designated section of Highway 666, 2 miles south of Cahone (not Yellow Jacket.....), and pick up trash and debris on both sides of our two mile stretch of road. Neither rain, sleet nor snow will deter us from completing our Civic Duty. However, we sometime wish we had the sense to come in out of that sort of weather. 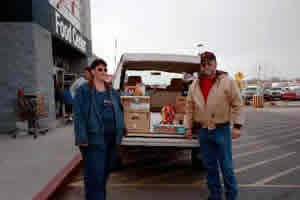 The Community Christmas Project was created to help out the less fortunate families in Cortez and surrounding areas. 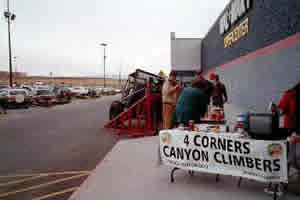 On December 2nd, 2000, the 4 Corners Canyon Climbers held a food drive with all proceeds donated to the Christmas Project. The Cortez WalMart graciously donated the use of it's sidewalk for the Club to set up our tables and display some of our vehicles. A last minute scheduling conflict with the Coca Cola Santa semi was averted and we all were able to set up in front of the WalMart. Our thanks go out to Coca Cola and WalMart for working with us that day! Despite chilly temps and being set up on the shady side of the store, the food drive was an outstanding success! 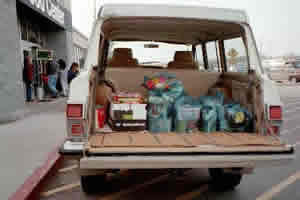 The Canyon Climbers gathered 177 food items to be donated to the Christmas Project! It was well worth freezing our butts off to know that several local families would have food for Christmas. Our most sincere thanks to everyone who donated food and cash to the drive. Your small generosity made a huge difference in someone's life! 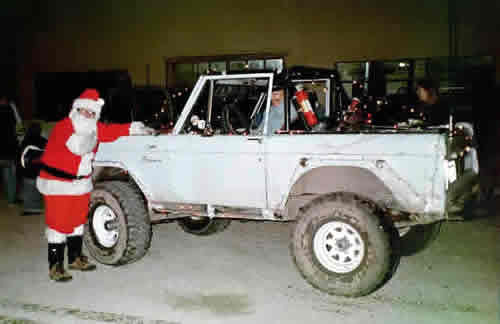 Every year Cortez throws a Christmas Parade open to all local businesses and clubs. The 2000 parade theme was "The Magical Glow of Christmas". 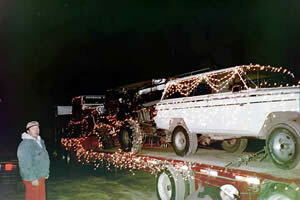 What better way to accommodate the theme and to show off our vehicles and club than to cover our rigs in Christmas lights and parade down Main Street? We were hard pressed to get our vehicles on the trailer and decked out in lights as the parade immediately followed our food drive and many of the vehicles on display at the drive were also going to be in the parade! We hustled and made it with time to spare. Unfortunately, our float ended up being the first to go, and the video crews that were there to film the event weren't set up yet. 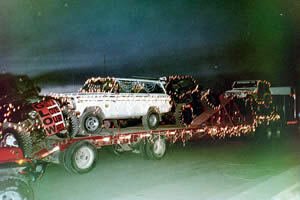 So our glowing rigs and Santa didn't get in the film coverage. 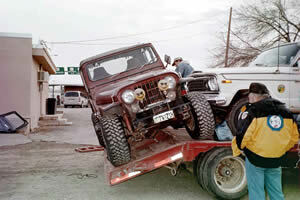 But we sure did make an impression on the crowd - especially with Clark's TJ and Dave's Bronco doing wheel climbs in the middle of Main Street! 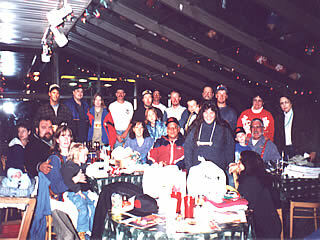 In 1999 we camped outside of Walmart and collected toys for the Toys for Tots Campaign. We also camped outside of City Market that year selling Rocky Mountain Chocolates to raise funds. Unfortunately, we can't seem to find any pictures for these activities. If we do I will get them posted to this site.